In my previous post, I argued how IT has become strategic owing to the demands of a digital business. Strategic IT cannot justify itself with IT metrics such as velocity or even with delivering to plan. It has to make a difference to business outcomes. IT agility takes on a new meaning in this light. It is not enough to claim that our development teams are agile. Engineering agility and delivery process agility are necessary but not sufficient for digital success. The table below explains this. Dev+Ops team agility Continuous delivery. Automated build pipelines all the way to production. Frequent releases Typically only address things downstream of #1 since addressing the upstream requires co-operation of business. Full product or solution team agility. Cross-functional team that includes product owners, designers and potentially even inside-sales and content marketers. Truly iterative development (as opposed to being driven by release-plans). Shorter end-to-end cycle times. Opportunity to shape a feature based on recent learnings from production. True market responsiveness may still be hamstrung by a deficit of organizational agility (explained below). Business Agility. Product or capability centric IT (as opposed to project centric). Independent software vendors (ISVs): where software is the business. Internet businesses: where a software platform is the product, for example e-commerce and all sorts of aggregators. The rest of Enterprise IT: where IT serves the business from behind the scenes. Large sections of enterprise IT are still struggling with #1 (development team agility) and #2 (DevOps). They claim to practice agile software development and DevOps but the actual realized benefits don’t match up. And while ISVs and Internet businesses are somewhat ahead of the curve, they frequently struggle with #3 and #4. Their attempts fall short of making the expected difference to business outcomes. Why is this? Their governance doctrine, management controls and team structures are pre-agile and therefore not geared to deliver overall organizational agility. To improve organizational agility, we have to take structural, operational, cultural and political factors into consideration. Structural change starts with an understanding of the relative merits and demerits of organizing by function. For example, given that IT by itself is a function, a matrix IT organization results in functional organization within a function and thus greatly hurts responsiveness. Operational change begins by recognizing that software development is a design process whereas we have usually attempted to govern it as a production process. Hence the traditional pursuit of predictability and disregard for actual benefits realized (value). Cultural change mostly results from changes to the way we work and changes in leadership behavior. Some deliberate intervention, however, is useful with regard to propagating desirable norms and a culture of purposeful, hierarchy-effacing communications. It’s imperative that we revitalize IT beyond the DevOps team to prepare it for the digital world and we get there through a combination of changes to structure, operations, and culture. 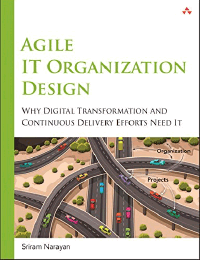 This is described in detail in my upcoming book, Agile IT Organization Design. Check out a “rough cut” edition of the book on Safari and watch this space for an upcoming announcement of a free "final cut" sample chapter.